Miss. Ethel Crickmay pictured with Jack the trace horse. An animal lover, Ethel was upset by the suffering caused to horses used to pull heavy loads, particularly coal, up the steep gradient of Wimbledon Hill. As a result she helped to found the animal charity “Our Dumb Friends League”. 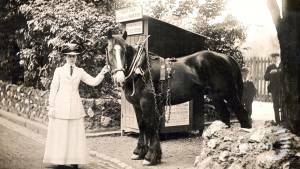 Having launched a public subscription, Ethel managed to raise sufficient money to purchase a succession of shire horses, each affectionately known as “Jack, the trace horse”. These horses were stationed at the base of Wimbledon Hill Road and harnessed to assist smaller cart horses with the upward climb to the village. The photo was taken in 1908 and the horse is the original “Jack”.